The 16th Annual Outdoor Sportsman Awards in Las Vegas Jan 21 added some excitement this year with the appearance of presidential candidate Donald Trump. The star of Duck Dynasty, Willie Robertson, endorsed the real estate billionaire in front of a live crowd, splitting with his father Phil who had put his support behind Texas Senator Ted Cruz earlier this month. Willie’s endorsement comes just days after Trump appeared with Sarah Palin in a maligned press conference. In addressing the crowd, Trump said that the shooting sports and hunting industries had his full support. The annual awards show honors the stars of reality shows on the Outdoor and Sportsman Channels. The event also featured a performance by John Fogerty. You can catch Duck Dynasty these days on Outdoor Channel along with the family’s other show Buck Commander. 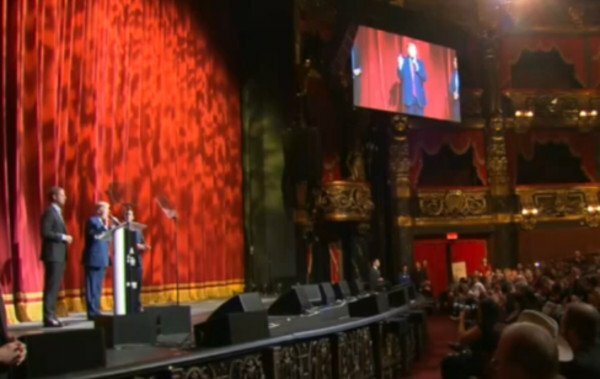 Watch the Donald Trump appearance here. You can find an interview with Trump about the second amendment here.